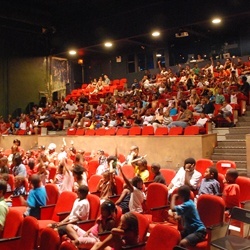 Kelly Strayhorn Theater invites you to connect your students to world-class performing arts! Join us for our spring 2015 season of artSEEDS student series to engage, inspire and excite your students (grades 6–12) with renowned performances, and intimate conversations with some of the most promising contemporary artists in dance. Post-show discussions connect students directly with the artistic team – not only performers but directors, choreographers and technical designers! artSEEDS Spring 2015 features two performances and discussions exploring Cuban life and their rich traditions, and then the story of a female boxer and her bout with domestic violence. We are thrilled to present the Pittsburgh premier of Malpaso Dance Company’s latest work at KST. Hailing from Havana, Cuba, Malpaso passionately brings Cuba’s rich dance traditions to life. See the world in a new way through the sights and sounds of Malpaso on the KST stage. After being left for dead by her abusive husband, a female boxer seeks revenge while testing the limits of redemption. Based on the real lives of iconic female athletes, The Wholehearted questions the line between reality and fantasy in this high intensity performance. To join us for this exciting series, choose your show then complete and return the artSEEDS Registration Form or Contact Desiree Lee, Education + Community Engagement Manager at 412-363-3000 x 315 or e-mail desiree@kelly-strayhorn.org. artSEEDS is supported in part by the Grable Foundation and the Henry C. Frick Educational Fund of the Buhl Foundation.